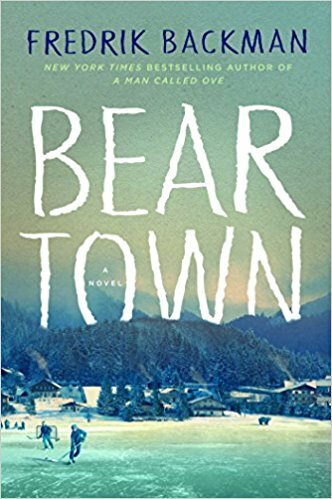 Last week I finished the book Beartown by Fredrik Backman. This is the same author who wrote my favourite book from last year A Man Called Ove. Like that book, I encourage you to pick up this book as well. It is a fabulously written novel about some very timely topics. I don't like to give anything away at all, so I will leave the plot points alone. I will tell you that it takes place in a small town (in Sweden but it could be anywhere) where hockey is king. The story is told from the perspective of the players, coaches, general manager, and their families. We join the story near the end of hockey season where the team that is the focus of the novel is ready for the semi-final. This author does such a good job of weaving the stories of the various characters together and giving you hints about what will happen or what has happened without explicitly spelling it out. He knows his readers are intelligent and he doesn't pander to them. That is my favourite type of book, when you need to pick up on clues on your own and if you're paying attention you get more out of the book. 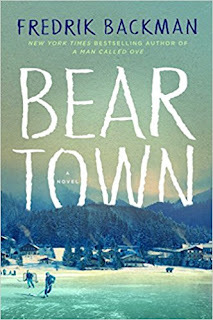 The characters are unique and have depth, but at the same time, you can imagine exactly what they are like and relate them to people you know in your own life. I mentioned above that the story is set in Sweden but the author does not really say that, you can just figure it out because they mention kronor notes (money) and Saabs. (In A Man Called Ove, it took me more than half the book to realize the story was set in Sweden and not England.) I think this is important because it means that the story is easily absorbed by its readers. This could be any town anywhere in the world where hockey or football or other sport is the thing that drives everything. The players are held higher than others, simply because of their place on the team, decisions are made based on winning and attracting the best players and coaches, and in this case a hockey school. One line from the beginning of the book that has stuck with me and I think will resonate for a long time is that life is just a series of moments, and that is why we like and do different things. Hockey (in this case, but could be anything) is just a game, but the moments of joy that it brings people make it worthwhile (Sidney Crosby's golden goal, 2010 Vancouver Olympics anyone?!). Sometimes we slog through life doing mundane things and it can easy to get bogged down and wish we were doing something different, or spending more time doing "fun things" or being with people we love. If we are always longing for perfection to be present all day long, then we will quickly become depressed. Rather I take small moments and those carry me through the otherwise mundane things. The moments are the ones that we will remember at the end of the day and stick with us.